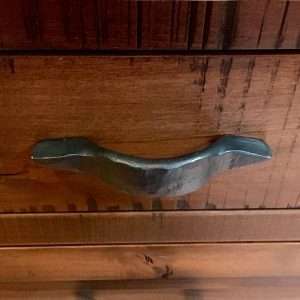 The Rustic hand forged Railroad Spike Drawer Pull is made from the remnants of a railroad spike. 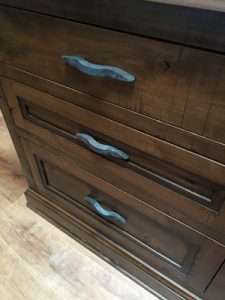 After a railroad spike cabinet pull or knob is made from the head, there is about 5″ remnant left over. The spike knobs are popular so it doesn’t take long to acquire a giant pile of spike remnants. 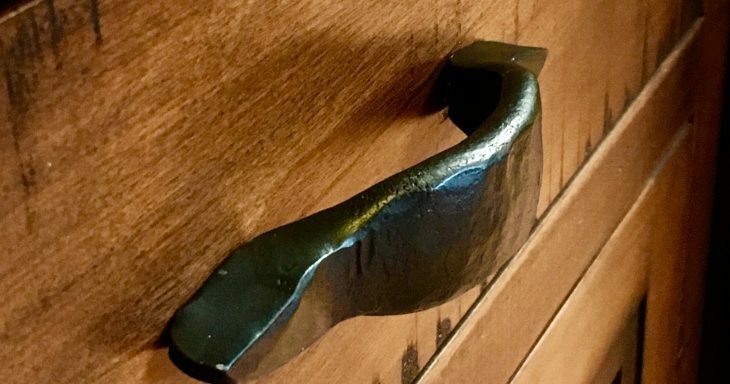 The very first spike handle I made from the remnants was the “Hand Forged Rustic Drawer Pull“. One end of the remnant was the pointed end of the spike and the other was square from the saw cut. The square end is heated and forged into a point to match the other side, then an arch is pressed and hammered for the grab. This has a nice rustic look but it didn’t keep up with the ever growing pile of remnants. 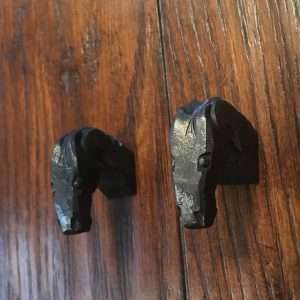 The second attempt was the “Horse Head Cabinet Pull“. Many of these little horses have been born and galloped off to greener pasture. They have been harnessed to pull cabinets and drawers and saddled with toilet paper and paper towels. Yet there is still more remnants. The latest attempt at tackling the remnant pile is the “Rustic hand forged Flattened Railroad Spike Drawer Pull“. This handle starts the same as previous rustic handle but is press flat with a 140 ton press brake to form a nice rounded flat handle. This handle has to jump into the fire 4 times before completion. First is to hammer the point. Second heat goes to press the arch. Third heat is for hammering the texture. The handle is drilled and tapped for mounting then debured and brushed. Then after brushing, which leaves the handle smooth but shiny, the handle is fired once more to bring back the patina of iron. The pictured handle is the natural iron color with a clear coat “Matt Clear”.